ITHACA, N.Y. – In 1959, Russian scientists began an experiment to breed a population of silver foxes, selecting and breeding foxes that exhibited friendliness toward people. They wanted to know if they could repeat the adaptations for tameness that must have occurred in domestic dogs. Subsequently they also bred another population of foxes for more aggressive behavior. 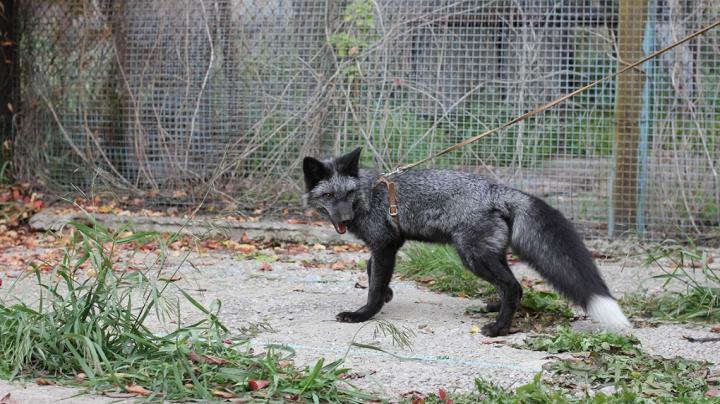 After 10 generations, a small fraction of the tame-bred foxes displayed dog-like domesticated behavior when people approached. Over time, an increasing fraction of the foxes showed this friendly behavior. Now, after more than 50 generations of selective breeding, a new Cornell University-led study compares gene expression of tame and aggressive silver foxes in two areas of the brain, shedding light on genes responsible for social behavior. The study, published online Sept. 18 in the Proceedings of the National Academy of Sciences, identified genes that were altered in tame animals in two areas of the brain involved with learning and memory. "That such a radical change in temperament could be accomplished so quickly is truly remarkable," said Andrew Clark, professor in the Department of Molecular Biology and Genetics at Cornell and a senior co-author of the paper. The research team obtained prefrontal cortex and basal forebrain brain tissue samples of 12 tame and 12 aggressive foxes from the Institute for Cytology and Genetics in Novosibirsk, Russia, where the foxes were bred. Clark and first author Xu Wang, Ph.D., a former research associate in Clark's lab, conducted two types of genetic analysis. In one investigation, they sequenced the RNA produced by all genes, which allowed them to measure how much every gene was turned on. The other test identified different versions of genes, called alleles, and measured how they changed in frequency in the population over generations. These analyses revealed which brain pathways were altered by breeding tame and aggressive foxes. The prefrontal cortex and basal forebrains are known for handling higher processing of information, including higher-level social interaction. The team was especially interested in neurons classified by the neurotransmitters (brain signaling chemicals) they release: dopamine, serotonin and glutamine. The pleasure centers in the brain are triggered by dopamine, and Clark said he expected those dopaminergic pathways to be altered in the tame animals. "Tame animals seem like they are blissed out all the time," he said. "They're just so happy and adorable, so I thought certainly the dopaminergic [pathway would be affected]. But there was no signal." However, the genes that impact the function of both serotonergic neurons and glutaminergic neurons were clearly affected by selection toward tameness. These neurons are important for learning and memory. Also, the analyses implicated genes important in the function of the neural crest, a transient group of cells that arises very early in the embryo. These cells migrate to form many types of adult cells, including those that determine skin and hair pigment (melanocytes), peripheral nerves, and the tissues of the face. The signals suggest a link to "domestication syndrome," a cluster of ancillary traits – white fur spots, shorter nose, curly tail and floppy ears – that pops up in domesticated canines, and in similar forms of other species. "Darwin, and many others since, observed that when people select for domestication, there is a tendency to see a reversion in these traits to a more juvenile form," Clark said, adding that more study of the neural crest's role in domestication syndrome is needed. The paper was written in tandem with another related study recently published in Nature Ecology and Evolution (NEE) that includes many of the same co-authors, including Clark, Wang, Lyudmila Trut, co-director at the Institute for Cytology and Genetics, and Anna Kukekova, the NEE paper's first author and an assistant professor in the Department of Animal Sciences at the University of Illinois. Kukekova has worked with Trut's lab in Novosibirsk, and is a former research scientist at Cornell's Baker Institute for Animal Health.